Anonymous sale; A. Mak, Amsterdam, 19 February 1918, lot 100 (to Goudstikker). C. Wright, Paintings in Dutch Museums. An Index of Oil Paintings in Public Collections in The Netherlands by Artists born before 1870, London, 1980, p. 370. W. Sumowski, Gemälde der Rembrandt-Schüler, Landau, 1983, IV, p. 2409, no. 1619, illustrated p. 2432. Old Master Paintings: An illustrated summary catalogue, Rijksdienst Beeldende Kunst (The Netherlandish Office for the Fine Arts), The Hague, 1992, p. 242, no. 2090, illustrated. The Hague, Schilderkundig Genootschap Pulchri Studio, Catalogus van de Collectie Goudstikker, October 1918, no. 46. Contrary to many contemporaries, Willem de Poorter painted almost exclusively small-scale pictures, often small portraits, figure pieces and biblical or historical scenes. De Poorter was profoundly influenced by Rembrandt, and although there is no documentation to support the assumption, it seems highly probable that de Poorter received his training in the Leiden workshop of Rembrandt alongside Jacob de Wet and Gerard Dou. Professor Werner Sumowski (op.cit.) points out that in the present composition the theme of Vanitas is addressed. 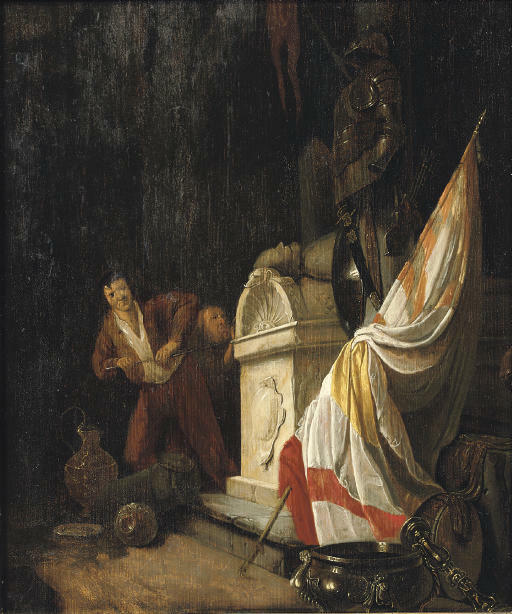 Besides a vanitas still life in the foreground, the motif of the robbers breaking open the tomb of a general alludes to the transience of earthly possessions including one's own body. De Poorter often treated themes that provided him with the opportunity to render different textures, such as shimmering armour, silverware and the marble of the sarcophagus in this work. He had a particular interest in painting still lifes and capturing the effect of chiaroscuro. In the past several pictures by the artist have been confused with those by Jacob Duck, and the similarities between Duck's motifs in, for instance, his famous guard-rooms and the present picture are evident.